Shechen Monastery is known as the one of the six mother monasteries of the Tibetan Buddhism. Built in 1980 it is situated between two other monasteries or right behind the Boudhnath Stupa, if I may say so. It is the house of around 400 monks and teaches music, dance, painting and Buddhist philosophy. 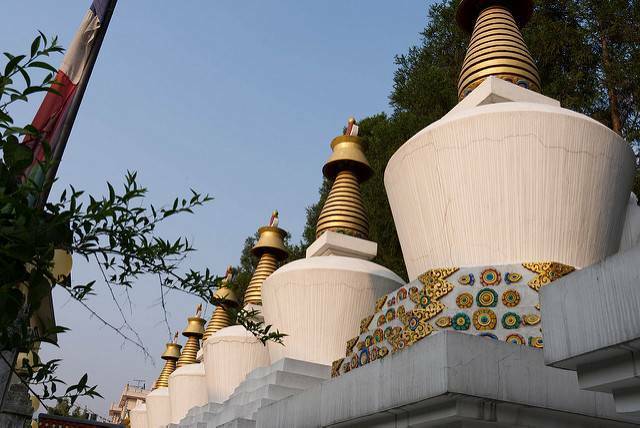 Shechen monastery is like Christmas for our eyes. Supporting red and gold this place has beautiful gardens surrounding it and a hug open space right in the middle. It contains dormitories, an art and handicraft workshop and showroom, a guesthouse and a restaurant. Visitors can easily get themselves a room here and enjoy their welcome. You can also witness some enchanting ceremonies that happen all year long. These ceremonies are colourful and beautiful. Shechen is famous for its particular style of sacred dance (cham). There is a constant background melody of gongs and chants. The walls are covered with paintings depicting the Tibetan Buddhist history and important teachers. The monastery has around one hundred and fifty statues and a huge library. Walking your way through the monasteries one of the favourite views is watching young monks playing football. Just smile and be a part of this friendly game with happy young faces. They are shy but friendly. It is believed that it took almost 10 years for various people / artisans to finish working on this monastery. This place is to solace. Get yourselves indulged in helping this community.